Yes. Any party to the contract with Edit privileges for a contract can upload attachments up until the time the contract has been completed. 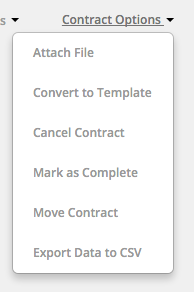 The Attach File option can be found under Contract Options to the right of a contract. The Attached files are viewable and downloadable from the right hand toolbar. Attachments do not transition between the Collaboration Contract to the Coupa Contract record at time of Authoring or Completion, files must be stored manually in both locations, if needed. Can I get a signed copy of my contracts?